No one individual learns the exact same as another. So, we offer a variety of interconnected learning opportunities to take each student on their yoga journey and help them experience “Now”. This class is open to everyone from beginners who have never taken a yoga class to teachers who want to deepen their practice and further their knowledge and experience of yoga. Mysore-style is based on a traditional method practiced in Mysore, India where a student practices at his or her own pace. The teacher’s role is to act as the eyes for the students, to help deepen understanding of poses through instruction and adjustments and to teach variations and new poses when appropriate. In our sessions, most students follow the Ashtanga Vinyasa sequences, are able to ask questions and, when necessary, use props or do restorative poses; whatever is required to help them gain all they can from their practice of yoga that day. A traditional Mysore-style practice is complemented by a “led” class. Here the teacher guides the class creating a pace and rhythm into which the student can surrender. There is a specific sequence of poses however students are encouraged to modify the poses as to their needs. A regular Mysore-style practice is essential for safely following a full primary led class. “Sama” means ‘center’ and “vinyasa” is a ‘step-by-step approach’. 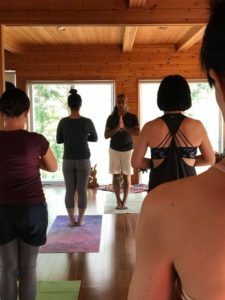 In this flow-style yoga class, the teacher provides options and modifications for everyone from beginners to advanced practitioners as attempt to find a deeper sense of our center, our core. 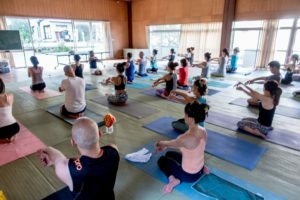 Each class, students are taken on a journey through a unique variety of yoga asana (poses) based on the principles of Ashtanga yoga. Book at ATHA YOGA Peatix page.